A true classic design with a brand new finish: brushed/antique look. Select Table Item napkin placemat runner tablecloth - 68" square tablecloth - 69" square tablecloth - 69"x108"
Tablecloths available in 2 sizes: 69" square and 69"x108" rectangle. 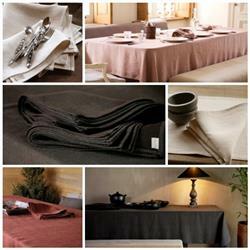 also matching dinner napkins, placemats and table runners. This collection is complemented by the Napoli Vintage BLANKETS and Napoli Vintage FLOOR CUSHIONS.